Unusually for Wales the 5-day forecast was showing clear weather. That usually counts for nothing with rain assured whatever the forecast, but rules are meant to be broken and the usual trek north saw me arriving at Gwern Gof Uchaf campsite to a clear sky and plummeting temperatures. Rather than brave the cold and camp we’d booked some space in the bunkhouse, though a few hardy souls were huddled around camp stoves outside their tents. 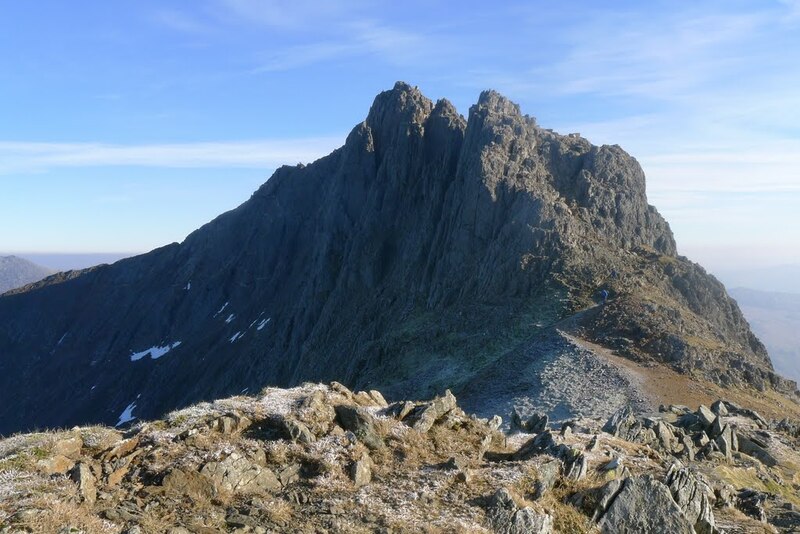 The plan was to hit Tryfan on Saturday and…..well, we’d see how the weather and our legs held up for the Sunday. 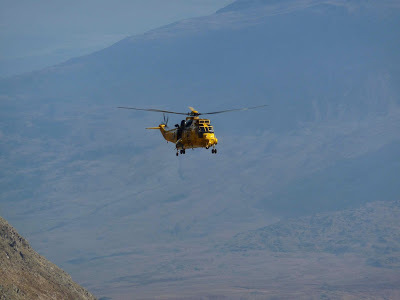 In the morning we dived back down to Capel Curig for a leisurely breakfast and headed back to the campsite to don our packs and head off to the foot of Tryfan. There was no snow visible but it had been a cold, clear night with temperatures of around -5 degrees. 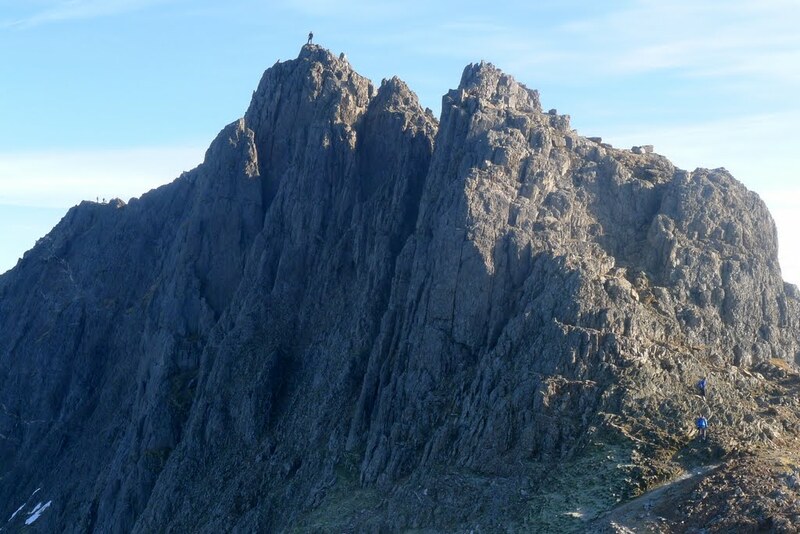 The north ridge of Tryfan offers a veritable playground of scrambling. It must be nigh on impossible to take the same route twice, though even after a few times I’ve started to recognise certain outcrops and notches. Being in a group of climbers we were minded to look for opportunities for hands-on rock wherever we could as picked our way through the boulders and short rock-faces. There’s never anything too committing with walls tending to be only a few moves each time, thus negating the use of a rope. It was clear it was going to be a beautiful day, clear blue sky and crisp bite to the air. Climbing gloveless offered a better feel but the cold meant we were unable to be without gloves for more than a couple of minutes at a time. As we gained height extra care was needed as the rock became covered with a thin frost requiring a firm foot placement with each step. We had been a little lazy with our start and didn’t reach the summit till around 1pm. The planned route up Bristly Ridge and across the Glyders beckoned but days are short in winter and we suspected we’d be descending in the dark. We were watched a group struggling to make headway at Sinister Gully at the foot of Bristly Ridge due the ice, so we headed down to Bwlch Trfan and headed via Llyn Bochlwyd. A warm evening in-front of a pub fire before retiring to the bunkhouse was welcomed, if not fully earned. Feeling a little guilty over our lazy Saturday we decided that we would get up early on Sunday and head up to Pen-y-Pass for breakfast before targetting Crib Goch. 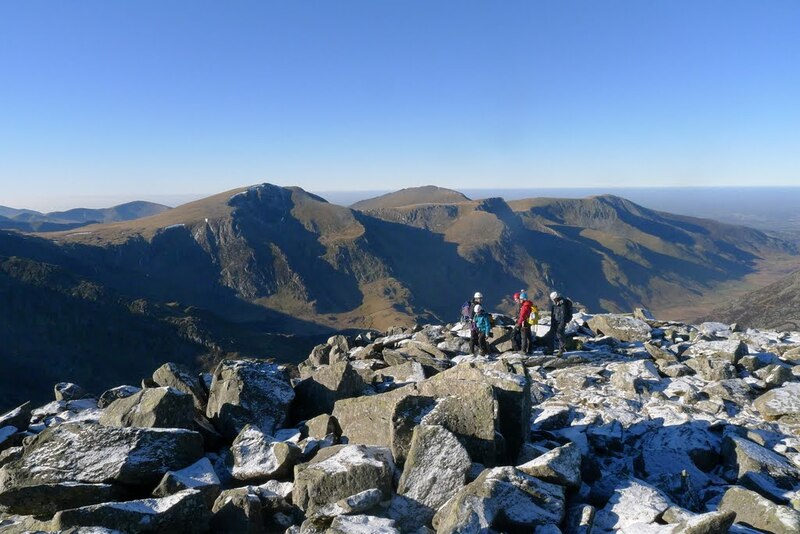 It promised to be another glorious winter’s day as we headed up the Pyg Track to Bwlych y Moch, taking care on patches of ice. 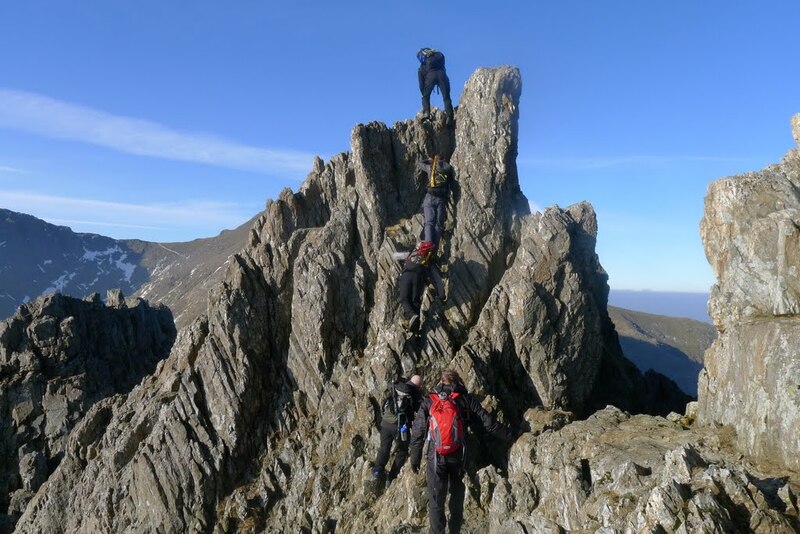 The climb up the east face of Crib Goch is unrelenting and a short sharp way up to 900m, but the angled rock makes for an easy scramble and we were soon on the summit staring along the narrow ridge. This was my first time up there and the view along the narrow ridge matched my expectations. We picked our way along, using hands to steady ourself where needed till we reached the pinnacles and the fun really began. They look more fearsome than they really are but care is needed. on the right. Snowdon keeps watch top left. We stopped for a quick cuppa just before the second pinnacle and watched one member of a group ahead of us (in the picture below) momentarily lose his footing, slip and be saved only by be a last-ditch two-handed flailing grab. This did little to calm any nerves ahead of us following them up, but it was short-lived and we soon heading down into Bwlch Coch. It was only when turning around and looking back you get a sense of the grandeur of the surroundings and the enormity of the drop into Cwm Uchaf below. Seeing other bodies picking their way along the ridge helped put things into perspective. We then made the mistake of taking a track just off the ridge which dropped us lower than anticipated and we faced a loose scree climb back up to the ridge for the pull up to the summit of Garnedd Ugain. 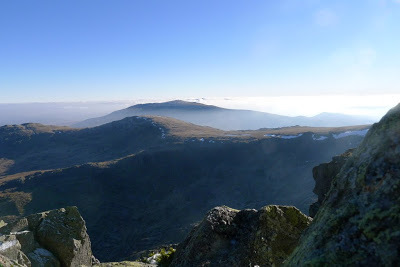 From the summit cairn we could hear shouting and it was apparent there had been an accident on the Pyg Track below. 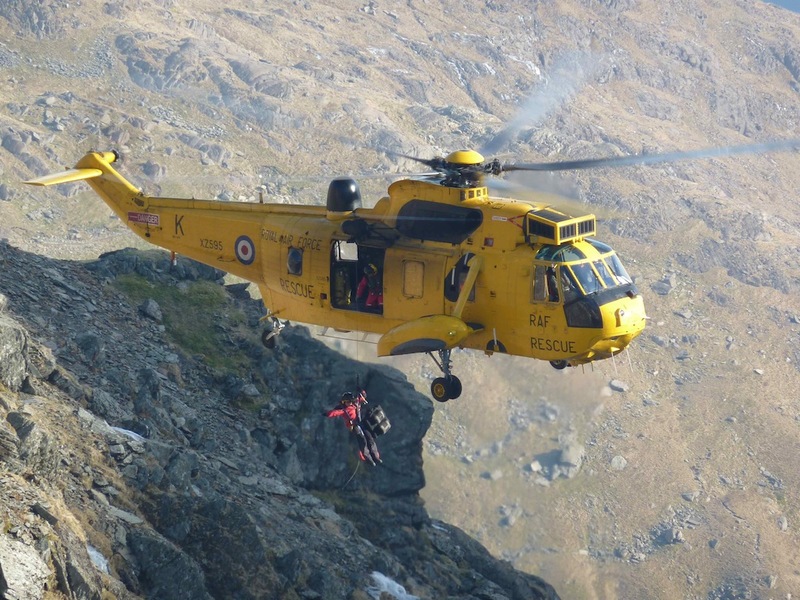 We could see a lot of ice on the zig-zag steps and it wasn’t long before a RAF rescue helicopter was in its way. Continuing up to Snowdon’s summit and looking back we could see that the casualty was laid on the bottom path directly below a long ice-fall coming down from the path above – it looked like she had fallen about 50m and was quickly winched up to the helicopter. 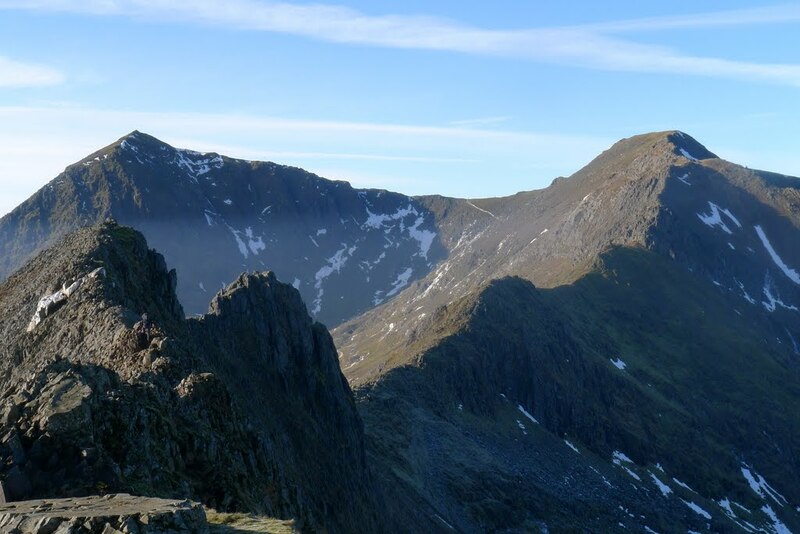 I checked the web on our return to see if there was any news on her condition but I couldn’t find any mention, though the news was somewhat unfortunately overshadowed by a walker fatally collapsing on nearby Carnedd Dafydd. In the pub afterwards we all made a point of making a donation to the Mountain Rescue team whom are sadly all too often taken for granted. So a quick weekend jaunt and my first taste of Crib Goch. As a first real outing of the year we couldn’t have hoped for better weather and it’s not often you can say that about North Wales! ← Previous Previous post: It’s been a while..? Cheers Jamie. Tis a great route! We tried a close up of the helicopter but couldn't see if Prince William was the pilot! Great trip Nigel and is tempting me back over that way again – though I suspect I'll never be that lucky with the weather! The photos are excellent too but the close up Sea King shot tops the lot! Great day for a walk/scramble on this interesting ridge.